2017-05-20 Last evening a friend from church invited me to join with several Christian brothers at the Ottawa Lakes Campground which is part of the Ottawa Lakes Recreation area in the Kettle Moraine State Forest just north of Eagle, Wisconsin for a men-only campout. Most arrived around 3:00 or 3:30 in the afternoon. Two of the group qualified for the ADA compliant cabin at the park which served as our "headquarters" and backup in case of weather concerns. 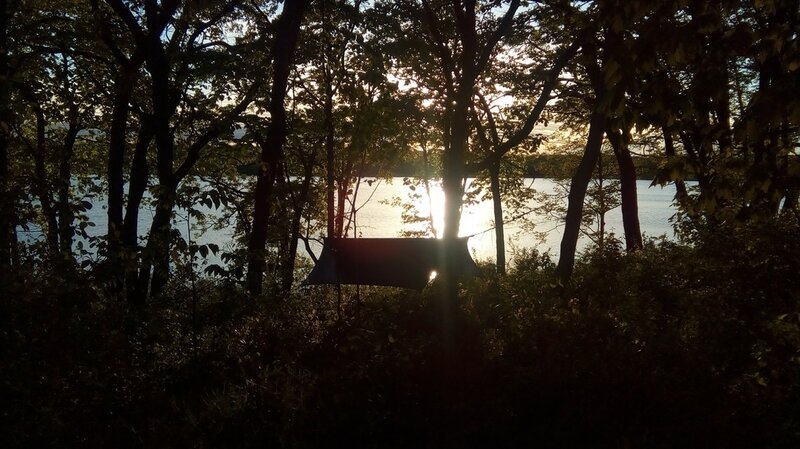 I slept in my hammock, two other guys slept in tents and the others slept in the cabin. When I arrived the clouds which had hung around the entire day began to thin out and about an hour before sunset it was almost clear providing us with a beautiful sunset. 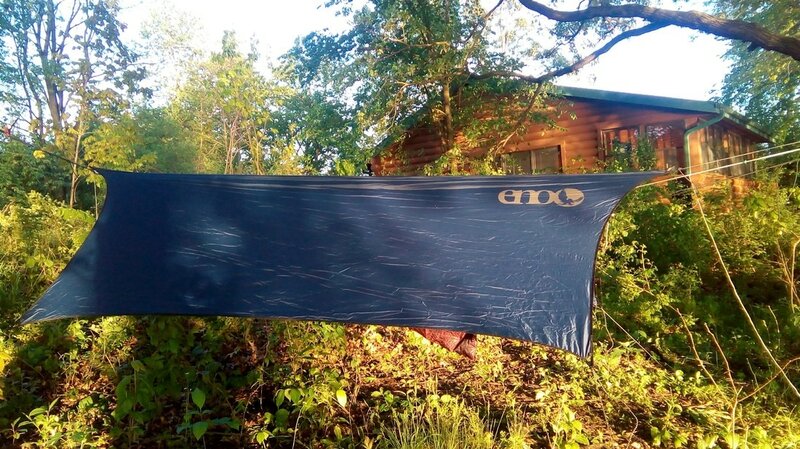 I put up my ENO DoubleNest hammock and ENO ProFly Rain Tarp. Since it was expected to get into the low 40's, perhaps even the 30's I supplemented my Snugpak Hammock Underblanket with a Costco Packable Down Throw attached to top side using Dritz Plastic Snap Fastener Pliers and Dirtz 20 sized snaps. I had planned to use the Snugpak Hammock Quilt with my DIY liner. But at the last minute I decided to take the Outdoor Vitals Summit 20 Sleeping Bag along and ended up using it. I'm glad I did. I was toasty warm, almost too warm. Hammock with the cabin in the background. blanket I had brought along curled up in my sleeping bag and didn't know the world existed until about 7:30. All was well. It was fun to impress everyone with the hammock setup and, that I actually slept out in it! Most had at best a passing knowledge of the existence of hammocks but no one had every actually looked into them seriously. A huge storm was moving in so I took everything down, put it in the car and after breakfast some singing and fellowship headed home. All in all it was a very good time with lots of good food, fun, meaningful fellowship and a little sleep.